When it comes to small-tipped brush pens, the Tombow Fudenosuke brush pen is second to none. I’ve used the Fude for years, and it has become a staple in my hand lettering kit. But there has always been something missing from my Fudenosuke experience — color. That is, it was missing. 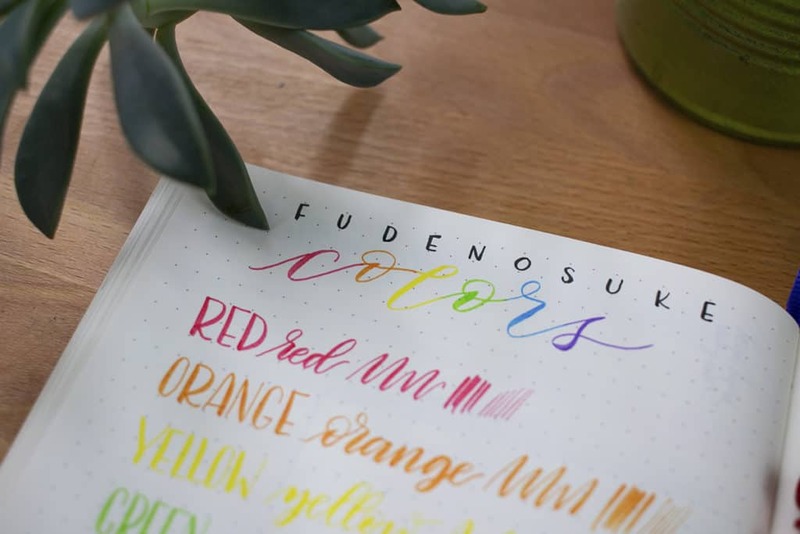 Recently, Tombow announced their brand new and much-coveted line of color Fudenosukes and I was able to get my hands on them before they hit the market. Now I’m going to share all the reasons that these brush pens rock in my Tombow Fudenosuke color review. These Tomobw Fudenosuke color brush pens are so freakin’ cool, I gotta say. I haven’t had them for long, but I’ve used them left and right and they are everything I hoped for. Since these pens are brand new to the world, they aren’t widely available. In fact, as far as I know, the only place you can get yourself a set of Fudenosuke colors is through the Tombow website directly. I’m sure they will soon start filtering into art stores and onto Amazon, but for now, you need to head here to get your hands on these beauties. How much do I love the Fudenosuke color brush pens? Let me count the ways. As with their black and grey counterparts, the Tombow Fudenosuke color brush pens are smooth as butter on the page. Writing with these brush pens is very easy and enjoyable. These brush pens are easy to control as you letter, which makes them great for beginners. They’re so easy to manage partly because of the firm brush tip and partly because they are more petite — unlike the Tombow Dual Brush Pens, which are a bit chunkier. Fudenosuke brush pens are more familiar to newbies because they are the size of a regular pen. Tombow Fudenosuke color brush pens are ideal for lettering in your bullet journal because of how small they are. You can easily navigate the more tight corridors of an A5 or A6 sized journal with thse brush pens. 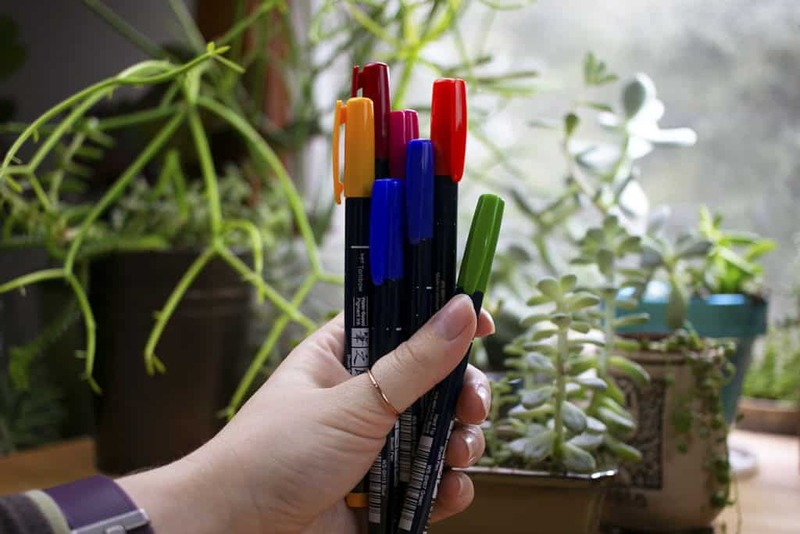 Since the Tombow Fudenosuke color brush pens are the size of normal pens, they are super easy to take with you to work, school, or anywhere else. When I first broke into my Fudenosuke colors, I was blown away by their vibrant hues. These colors don’t back down! 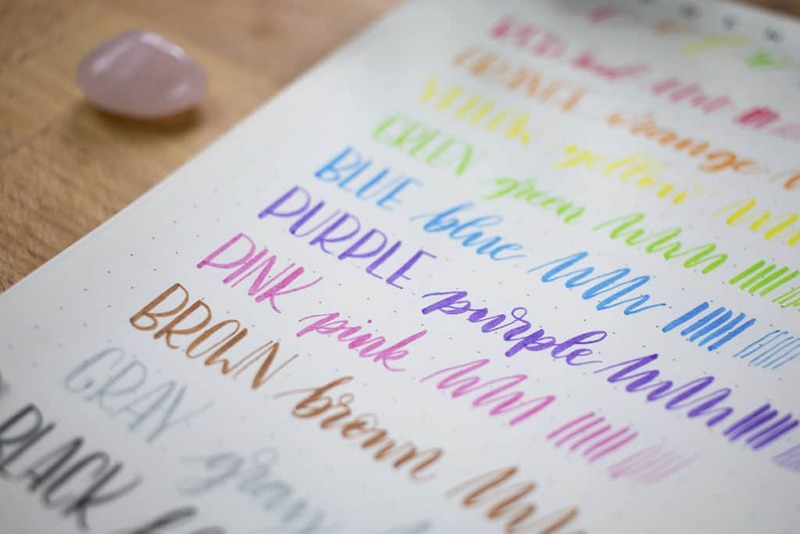 The Tombow Fudenosuke color brush pens definitely shine and make your writing pop off the page. There are two sides to everything, and the Tombow Fudenosuke color brush pens are no different. Here are some of the less ideal qualities of this set. Of course, we have to address the expense of these pens. The Tombow Fudenosuke color set has been sought after for a long time, so it’s no surprise that they aren’t exactly cheap. They aren’t wildly expensive either, but it’s enough to make you pause before hitting “order”. I imagine the price will go down after they have been on the market for a while, but you can expect the price to stay right where it is for a few months at least. I love that Tombow finally pulled the trigger and released this set of Fudenosuke color brush pens, but I’m not personally a huge fan of this standard range of colors. I don’t dislike them, but I don’t tend to reach for the bold rainbow colors with my other brush pens. 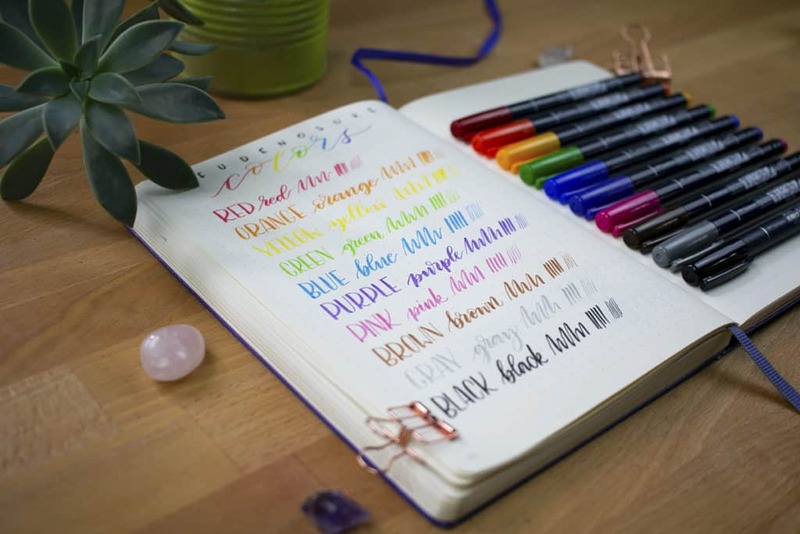 Perhaps I’m just greedy, but I’d love to see other palettes of colors, like the pastel or galaxy Tombow Dual Brush Pen sets. One of these days, I hope! This set of Tombow Fudenosuke color brush pens consists exclusively of hard-tipped pens. While this doesn’t bother me at all, I know it might be a big drawback for others. I know I enjoy the soft tip black Fudenosuke, but I don’t mind the hard tips at all. It’s just something to note if you’re not a big fan of hard tip Fudes. It’s been a long time coming, but it’s been worth the wait. The Tombow Fudenosuke color brush pens have totally rocked my world and I’m so excited to continue using them. There is nothing more exciting than seeing one of your favorite pens get new brothers and sisters. Hopefully, Tombow sees how happy we are with these brush pens and grows the line of Fudenosukes even more! 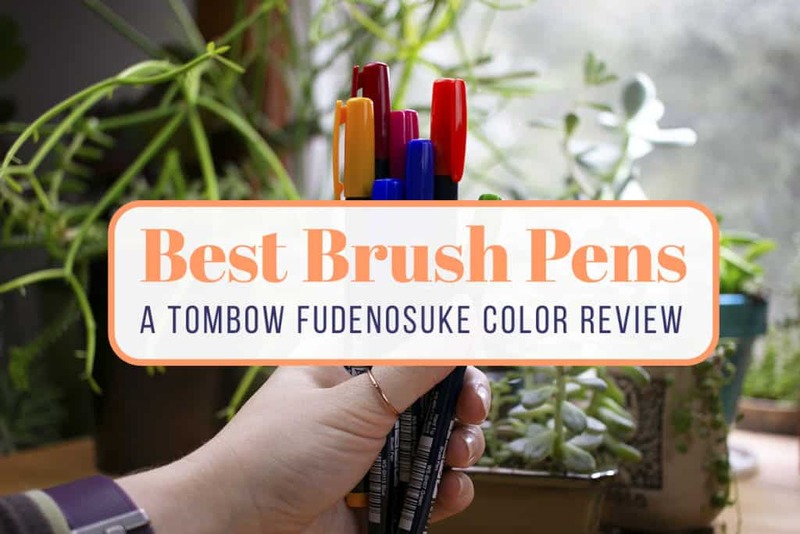 I hope you have found this Tombow Fudenosuke color review helpful! Let me know in the comments section what product you want me to review next, and head to the My Supplies page to see some of my other favorite materials! I was so excited about the color (!) aspect of these that I didn’t even realize they were the hard tipped fudenosuke pens. What a disappointment they were to me as the thin lines were not like cutting warm butter and made a scratching sound and sensation. Sorry to hear they weren’t quite what you were looking for Lyzz. Hopefully you find something else that works well for you. Hey Tereza! The pens have water-based ink, so I wouldn’t suggest putting water on your work. However, if the ink has been dry for a while, it stands up to water a bit better than I expected. I hope that helps! Yes! Absolutely. I don’t want to try water. But I am looking for some Color Brush pen like fudenosuke hard Brush. I would write with it in travel/family journal. So if it manage some accident or to stay a little bit readible. If you have another tip I will be glad. I’m SO keen for these pens it is ridiculous! At the moment though, I agree with you Shelby – I need more colours. I’m so happy that they’ve finally given us some colors to work with, now to just wait for more of them! Thank you for another great review. I’m with you on the colors. I’d like to see pastels, galaxy as well. I wouldn’t mind jewel tones either. Maybe we just have to be patient. So excited to try these, Shelby. I LOVE my black ones for faux calligraphy. I clicked on your link and as a first-time buyer got a 15% discount code. Thanks for the review! I wish someone would come out with a left handed version of the hand lettering instructions. Some of the instructions don’t work with left handedness, especially in slanting the writing and some of the down strokes are upstrokes if you’re left-handed. Not something I thought about until I started trying this myself. They look pretty, but I am still too much of a novice for more supplies – yet. Hey there, Shawna! I imagine it’s quite frustrating to be a leftie in the lettering community. I wish I could help directly, but being right-handed, my advice for a leftie would only be a guess! However, you might like @honeydarko on Instagram. The account features an amazing left-handed lettering artist, and there are lots of videos so you can watch her work. I hope that helps you out! Just wondering, since the ink is water-based, does that mean that getting the page wet after writing will obliterate the writing? Does it mean it’s washable if you (heaven forfend!) get it on your clothes? By the way, I love your blog – it’s one of just three BuJo blogs I follow. And of course, you get credit for getting me to buy my Tombow Dual Brush pens! Thanks so much, Jenny! I’m so glad you’re on the Tombow wagon ? The Fudenosuke colors have water-based ink, so they aren’t permanent. If you apply water shortly after writing, you will swipe the color around and end up ruining your lines. However, I just used a wet watercolor brush on some lines I put down two weeks ago and nothing came up. I’m sure if you keep working it, you will pull up color, but you’ll probably be fine with an accidental splash of water. I’m afraid I’m not sure how they do on clothes, but since they’re water-based ink, I imagine they’d come off in the wash with soap. I hope that helps!